"Israel George Lash (1810 - 1878) was a Congressional Representative from North Carolina; born in Bethania, North Carolina, August 18, 1810. He attended the common schools and the local academy in his native city; engaged in mercantile pursuits and subsequently became a cigar manufacturer; also engaged in banking in Salem, North Carolina; delegate to the State constitutional convention in 1868; upon the readmission of the State of North Carolina to representation was elected as a Republican to the Fortieth Congress; reelected to the Forty-first Congress and served from July 20, 1868, to March 4, 1871; was not a candidate for renomination in 1870; again engaged in banking in Salem (now Winston-Salem) N.C., until his death there on April 1, 1878; interment in the Moravian Cemetery, Bethania, N.C."
What is significant about this man to me is that he is connected to the Lash family of Brookberry Farm, off Meadowlark Drive in Winston-Salem, NC. "US Congressman. Banker and cigar maker Lash was elected as a U.S. Representative from North Carolina from 1868 to 1871." The following photo was taken in 1865. "Salem branch: There were three individuals initially appointed in 1815 to act as agents for the Bank of Cape Fear in Salem. Charles F. Bagge, cashier (July 1815+), in some records also referred to as president, even though this was an agency operation until 1847; Emanuel Schober (July 1815), John Christian Blum, agent (July 1815 -1827); Friedrich Heinrich (Henry) Schumann, agent & cashier (1828 -1847), a physician who also was involved with the Salem Manufacturing Company and its cotton mill in Salem; Israel George Lash, cashier (1847 - 1866)." "As early as 1815 the Bank of Cape Fear, Wilmington, N.C., appointed agents in Salem. Two years before the founding of Winston, the formal business of banking was launched in Salem with the establishment of a branqh of the same Bank. 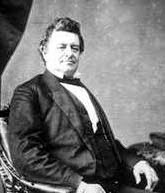 Israel G. Loesch, or Lash, was the first banker. The bank was housed in a brick building located at what is now the southwest corner of Bank and Main streets. This branch bank seems to have prospered until it went down in the general financial crash of the Civil War. In 1866, Lash opened a bank of his own, the First National Bank of Salem, using the same building which had sheltered the branch of the Bank of Cape Fear. Following the death of Israel Lash in 1879, the bank closed its doors and the banking center of the community moved into the new village of Winston. "The Wachovia Bank & Trust Company dates back to the establishment of the Wachovia National Bank in June, 1879. This institution had as its president Wyatt F. Bowman, E. Belo as vice-president, W. A. Lemly (formerly associated with Israel Lash in Salem) as cashier, and James A. Gray as assistant cashier. Lemly was president of this flourishing institution from 1882 to 1906 and James A. Gray from the latter date to 1911. The bank started business with a capital of $100,000 and in about two months it was increased to $150,000. In 1888 the bank was moved from its original build- ing on Main Street to the corner of Main and Third streets, where it occupied a three-story building on the present site of the Main office of the Wachovia Bank and Trust Company. "In 1893, the Wachovia Loan and Trust Company was organized by F. H. Fries and his nephew, H. F. Shaifner. Its first home was in a modest one-story wooden building on the east side of Main Street between Second and Third in Winston. The directors were James A. Gray, J. E. Gihner, C. H. Fogle, J. C. Buxton, J. H. Millis, T. L. Vaughn and R. J. Reynolds. Two of these directors, Messrs. Gray and Buxton, were closely identified with the Wachovia National Bank! Gray was elected a vice-president of the Trust Company at the beginning but was not active until later." Another tidbit about Lash and Gray, Debbie McCann found an 1878 deed in which Israel G Lash sold a plot of land to James A Gray.